Thanksgiving food is digested. It took a weekend of no posts to get there, but I'm digested. I'm kidding. 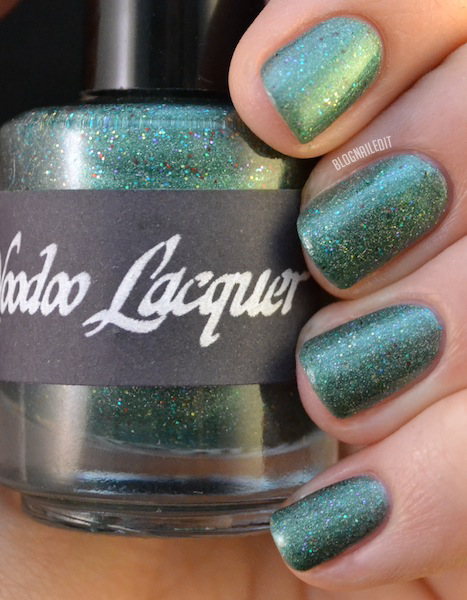 I was actually a busy swatching bee, prepping for this week, which will bring you three different reviews from three different polish companies. And since 'tis the season, you'll definitely start getting your fill of holiday beauties! The cardinal collection is another Voodoo Lacquer collection. 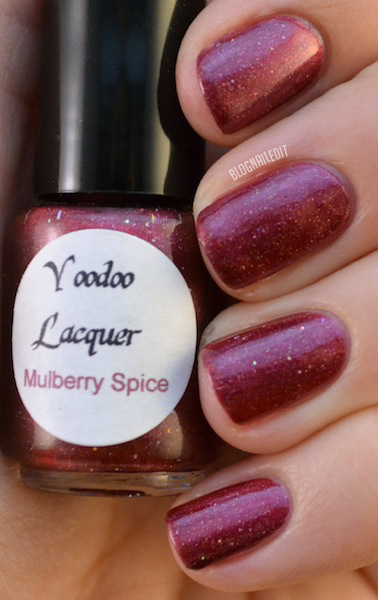 You'll remember my 'glowing' review of the Halloween colors, and as promised, she has released a new collection of chilly, wintery, festive colors! She's got six beautiful colors which touch the winter bits of the season, as well as the Christmas aspect of it all. One thing I noticed about these polishes was a strange film that seemed to develop around the neck of the bottle after dipping in a few times. I'm not sure what that was about, but it made application more difficult than I would've liked. It didn't have an effect on the final look of the polishes, except in Mulberry Spice, where it was just too much for me to deal with. Read more about that below. 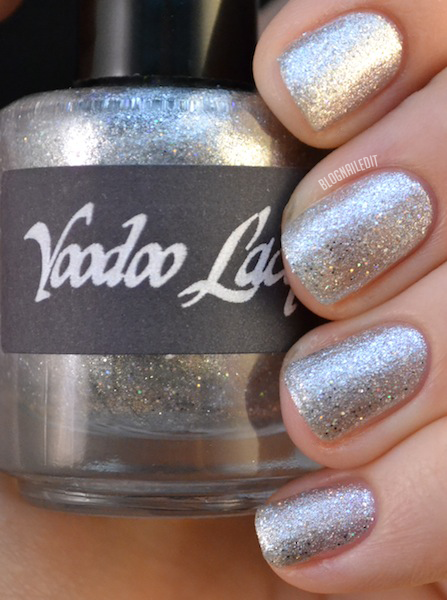 I did like these colors, but Silver Bells and Winter Bliss are the absolute winners in my book of this collection. I loved Silver Bells so much, I wrapped my nails in it, and tied it off with a bow! The first color is Winter Bliss (5 coats). Don't be alarmed by the 5 coat bit. I used 5 coats without anything underneath, because I wanted to show you that it's an intentionally very sheer color. It would be beautiful layered as well, but check out how soft it is on it's own. It looks like Jack Frost kissed my fingers and left me with just a memory of the night. I really enjoyed this polish a lot! 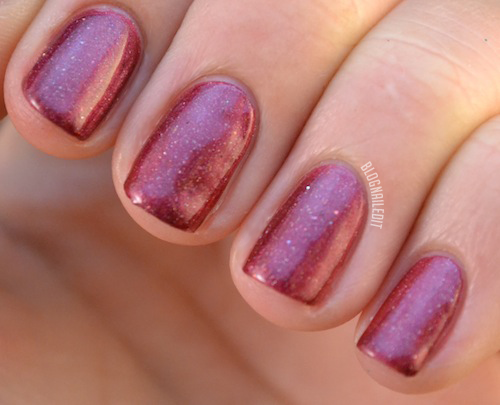 Sugar Plum Fairies is shown with 4 coats. 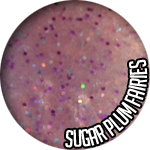 The polish is sprinkled with fine sugary grains of glitter. That little bit of grit in the polish looks best with four coats for opacity, but I feel like layering would work beautifully as well. I was really hoping this polish was scented. 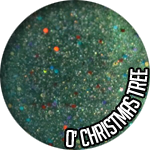 It has such a beautiful rich color that really felt like a Christmas tree, so this was an appropriately named polish: O' Christmas Tree. This is just three coats. I suppose its one of those fake Christmas trees with the fiber optics though, because there's some hints of holographic glitter in there! 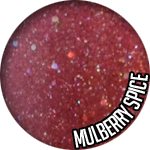 Mulberry Spice is shown with 3 coats. I liked the deep red color of this, but it was a terrible application for some reason. It very well could've been a result of the sample size bottle it came in. (Heather was running low on supplies so could only make enough for a sample size.) There was that strange film that sloppily spread over at each coat I mentioned earlier. I want to describe the texture as very kombucha-esque. That was hard to get past and made my nails bumpy. I tried my best not to show that in the pictures though. 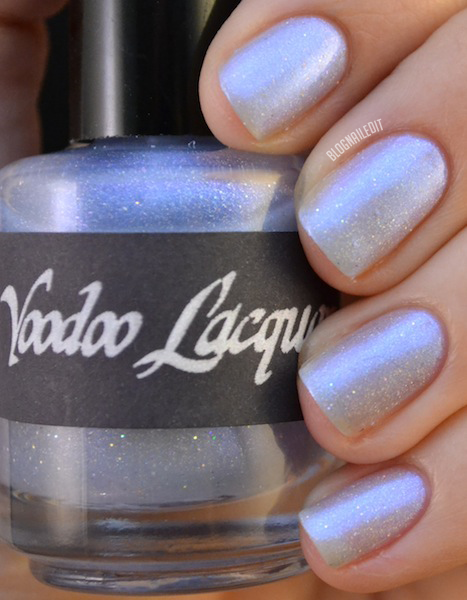 Fa, La, La, La, La (2 coats) is the only piece in the collection that has a clear base. 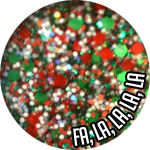 It's the quintessential Christmas polish, with its red, green, and holographic pieces of glitter. I layered it over yellow for a change. Silver Bells should be called "Bling Bells". This color is AMAZING. As with all the polishes, there was the slight cling film, but it in no way overpowered the awesomeness that is this bottle. You can see the obvious inspiration for the name, but what you may have missed were the pieces of slightly larger holographic ingredients. You can pick those out in the bubble swatch best. So that's it! Thank you for the beautiful colors Heather! You can all get your own bottles right now in her Etsy shop. 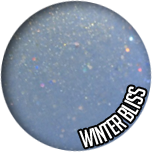 I definitely recommend Silver Bells and Winter Bliss. They're both unique and make wonderful additions to your holiday collection. 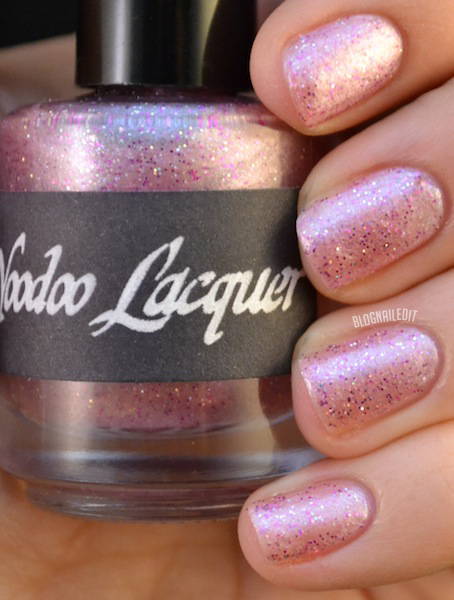 These products were sent to me by VooDoo Lacquers. The reviews are based entirely on my experience with the products and were in no way influenced by anyone. Silver Bells is my personal favorite, so beautiful with the tapes on it! :))) It gives me absolutely the Christmas feeling. 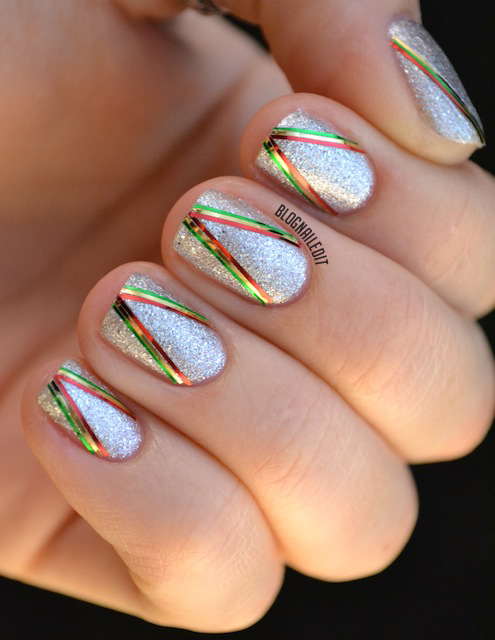 Love silver bells, especially with the striping tape! I love Silver Bells! 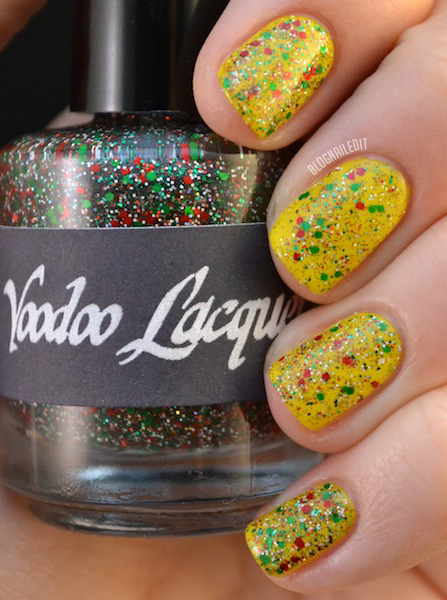 And I love that you layered Fa-La-La over yellow, it makes me think of Feliz Navidad! These polishes are awesome! I love your "wrapped" mani with the striping tape, it's so fun! They all are beutiful. Where can I find this brand Voodoo? There are several links in the post.